I have previously written about how to, effectively, subclass using Nsubstitute; in this post, I’ll cover how to partially mock out that class. Before I get into the solution; what follows is a workaround to allow badly written, or legacy code to be tested without refactoring. If you’re reading this and thinking you need this solution then my suggestion would be to refactor and use some form of dependency injection. However, for various reasons, that’s not always possible (hence this post). Well, we have some (simulated) DB access, so the code will error. And now the test passes. TLDR – What is this actually doing? To understand this better; we could do this entire process manually. Only when you’ve felt the pain of a manual mock, can you really see what mocking frameworks such as NSubtitute are doing for us. As you can see, now that we’ve subclassed MyFunkyClass, we can override the behaviour of the relevant virtual methods. In the case of MethodOne, we’ve effectively issued a DoNotCallBase(), (by not calling base!). For MethodTwo, we’ve issued a DoNotCallBase, and then a Returns statement. That’s much cleaner – why not always use manual mocks? It is much cleaner if you always want MethodThree to return 5. Once you need it to return 2 then you have two choices, either you create a new mock class, or you start putting logic into your mock. The latter, if done wrongly can end up with code that is unreadable and difficult to maintain; and if done correctly will end up in a mini version of NSubstitute. 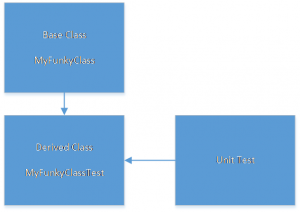 Finally, however well you write the mocks, as soon as you have more than one for a single class then every change to the class (for example, changing a method’s parameters or return type) results in a change to more than one test class. It’s also worth mentioning again that this problem is one that has already been solved, cleanly, by dependency injection. This entry was posted in C#, Unit Testing and tagged c#, Dependency Injection, DoNotCallBase, ForPartsOf, Manual Mock, Mock, Mocking Framework, NSubstitute, Partial Mock, Returns, XUnit on March 22, 2018 by pcmichaels.